XG-KCQ Series Automatic Ultrasonic Vial Washing Machine, as the new generation GMP complied vial cleaning machine, is widely applied for sterile product manufacturing in biopharm industry, it is applicable for vial, ampoule, oral liquid bottle washing. 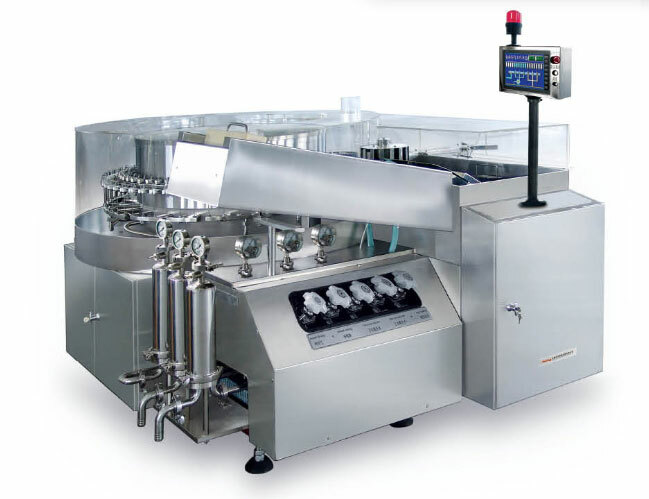 It is adopting the state of art technology that washing with “ no contacting to vial”, ultrasonic generated by the machine will remove the dirt on the vial, and this ultrasonic will also crush all kinds of microbe, E.coli and other similar bacteria attached on the vial, so that cleaning, sanitization is achieved on this machine. This machine can be synchronized with the tunnel sterilizer. In this vial washing machine, vial is fed by screw pushing, and the mechanical arm will turn the vial/bottle upside down (180°), and then the needles are inserted to the vial for PW circulation washing-PW washing- Air blowing-WFI washing- Air blowing- Air blowing (we call three washing, three air blowing), and at the same time the inside and outside of the vial are blown dry, and then turn 180° again to stand up, and then the washing process is completed. § Touch screen and PLC control, failure display and automatic alarming system are included. § The rolling table is manufactured on Germany imported digital control machine, and the mechanical accuracy is ±0.001mm, so that the needle will be stably inserted to the vial to ensure low vial breakage. § Driven part is large inner gear structure, so that the vial mouth can be matched with needle. § Most of electric parts are CE complied multinational brand. § Control system including touch screen, PLC and modules are from Siemens. § No bottle alarming, full bottle alarming and machine stop function.